The bus station in Valletta is near the main gates to the city. There are various fast food stands for snacks and drinks at the bus station. Catch the bright yellow buses to tour the island of Malta cheaply. 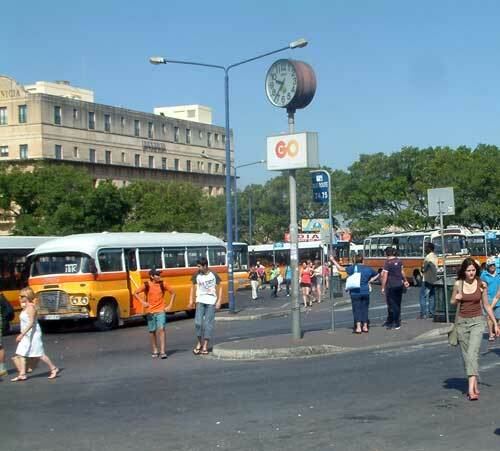 The main bus station in the capital Valletta has buses that go to all parts of the island. Depending on where you are staying, you may have to catch a bus to Valletta first. The buses are all painted yellow but differ in age; there are modern buses and ancient buses with character. Vehicles last longer in the balmy Maltese climate. All buses still have a bell to indicate to the driver that you wish to stop at the next bus stop. The bus stops in Malta have signs written in English. You will need Euros to pay the driver.